For a truly gentrifying neighbourhood, one can not just have commercial places. Some of the numerous warehouses and factories will have to be converted into stylish lofts, apartments or residential homes. That was the case of the former warehouse of Confidence Ltd.. At its heyday, this was one of the warehouses of one of the biggest llama soap manufacturers in the region. Times have changed, though. Confidence Ltd. closed down years ago after a series of bad marketing decisions - yes, I'm looking at you, scented llama spit! The building lay abandoned, rotting, for years, until it was converted. There comes a time in every city's history in which postcards and pictures capturing some of most jaw-dropping landscapes of it swarm the Internet, catching the attention of millions of hipsters worldwide craving for a latte served in a mason jar and avocado toast while sitting on stools made from repurposed wood. When that time comes, abandoned industrial areas gain a second life. Every month new refurbishing plans are announced for old warehouses and factories. For my Build-A-City-Challenge (BACC) neighbourhood of Trirnes, that time has come. Thus, the old Confidence Warehouse has been refurbished into a home suitable for those long bearded folks with alternative spellings of their names. 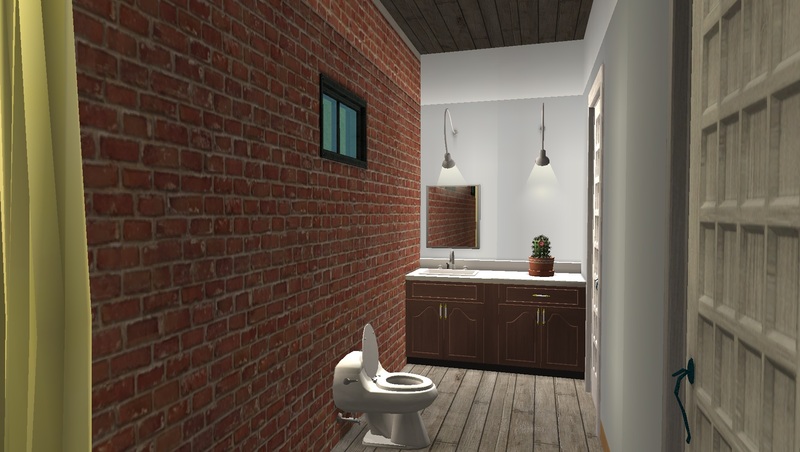 This one-bedroom, one-bathroom house is located on a coveted corner lot (more information below). Outside, part of the asphalt that covered the loading docks has been swapped for organic soil, allowing the growth of vegetation. With some more TLC, future tenants can have a proper backyard there. 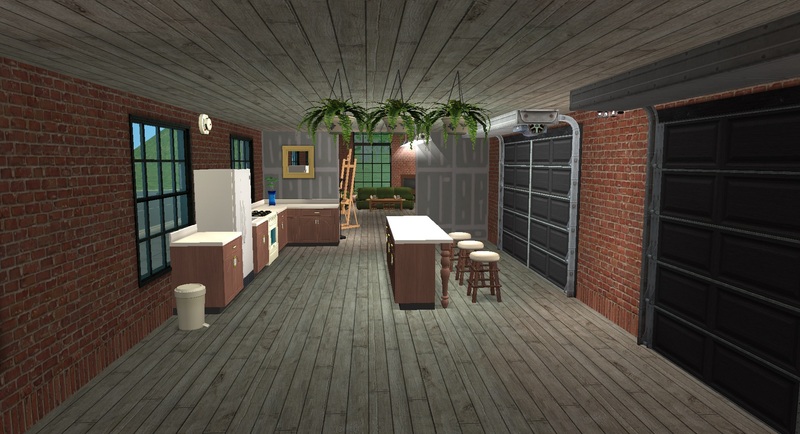 Inside, behind the old garage doors there's a kitchen (counters made from repurposed wood), partly divided from the main living area by some half-painted walls. The two-and-a-quarter stories high living area is comfortable and lets in plenty of light. Two ladders from the original Confidence Ltd. Warehouse give access to the bedroom and bathroom. 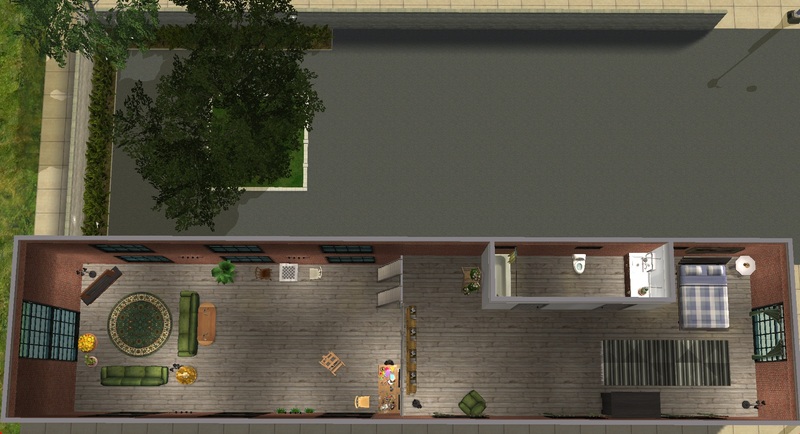 Every need and skill can be taken care of here - well, technically social can't, because there's no phone, but if you chose a gentrifying neighbourhood as your living place, you'll definitely have lots of Sims nearby out and about! If you are antisocial, well, I guess you'll have to buy a phone after all. Body also doesn't have its own object, but there's plenty of open space to jump rope, both inside and outside, if you have the EP (EDIT: you definitely have the EP. since I remembered you need at least the same EPs I do ) that added that interaction (I'm guessing Freetime?). 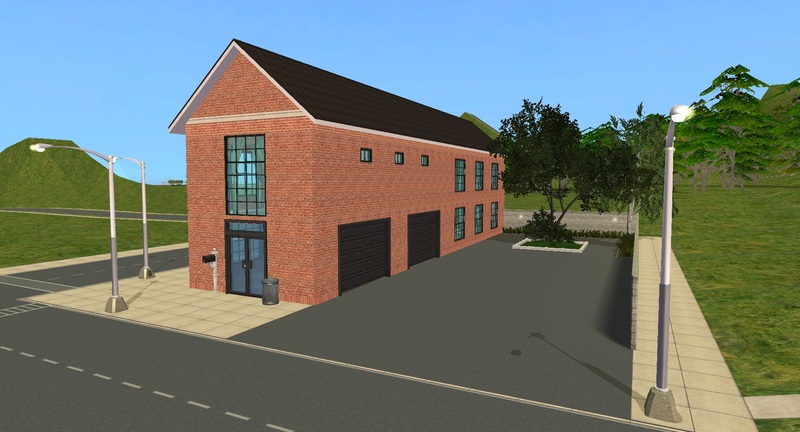 This building came to be as the home of my next Sim in my BACC hood. I had one CAS Sim available and my sister suggested I made a hipster that saw photos of the neighbourhood and decided to go there, eventually creating a whole area of hipsters. She suggested his house to be as stereotypically hipster as possible (hence the stereotypical description I have been making throughout this text). At first, I was just going to build this for my own enjoyment, but halfway through building I decided it could be a good lot to share. Since I started from the outside, you'll note that the vast majority of CC are build items (only two items are Buy Mode objects), because after I decided I wanted to share it, I tried to use as little CC as I could. - This lot is a 3x2 lot. 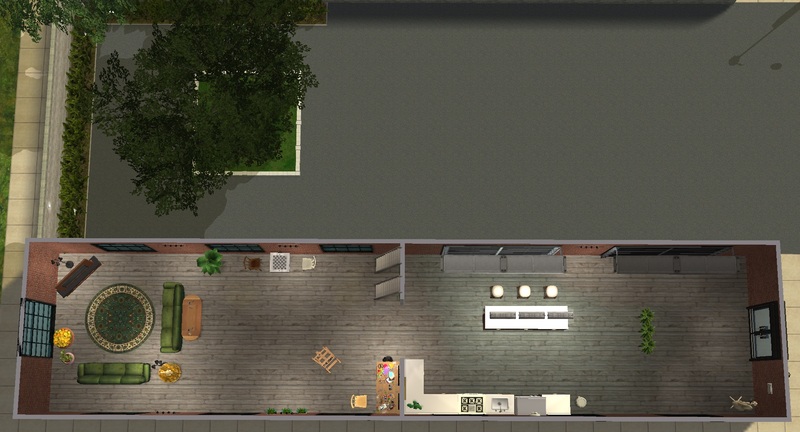 However, it isn't a normal 3x2 as this one is a corner lot. You will need a road on the front AND on the right side of this building to place it. On the bright side, that means more space to socialise (remember the no-phone aspect?) and the driveways on the side are actually usable (there are two driveways plus two extensions, for a total of 4 car spots). 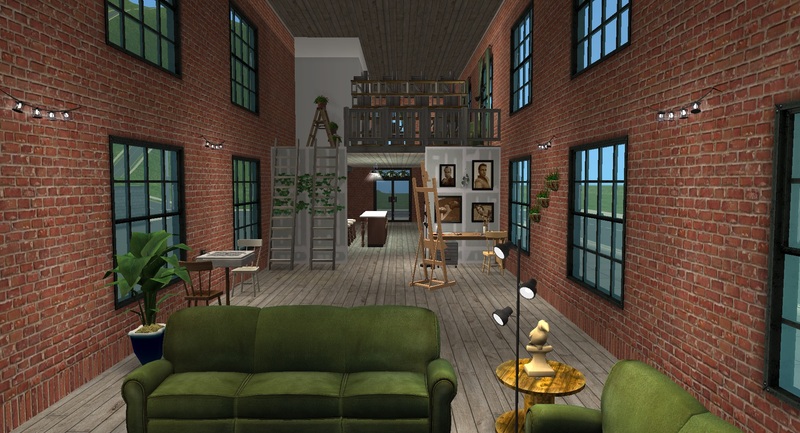 - As the living area is two stories plus a quarter height wall high, there are no ceiling lamps there (placing them would require a copious amount of OMSPs and I tried to cut down on the CC!). Remember that if you wish to redecorate. The same applies to the bathroom and bedroom, though those are easier because they are only one story and a quarter high. The kitchen is at normal height. - You will need to get the Miasmata set by Ohbehave at GoS for the garden. - EDIT: If you have Voeille's Pond & Sea Water Overhaul mod, don't worry about the water. There's a square of pool hidden under the tree, so the water will be normal. 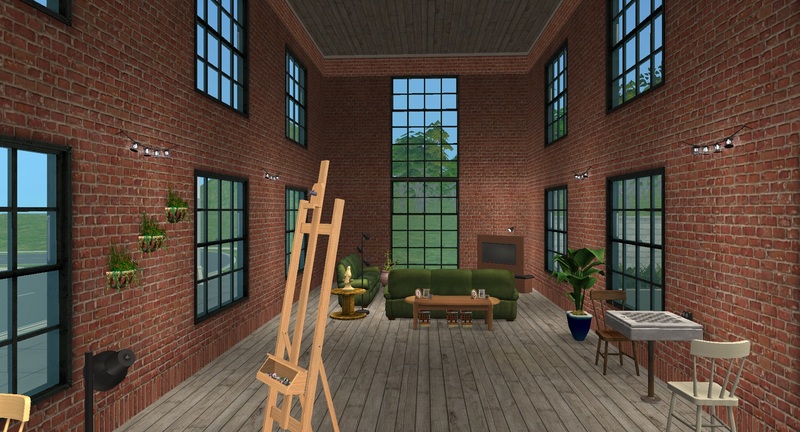 Even though no Sim ever set foot here, the lot was compressed with Chris Hatch's addon and then checked with SimPE. It's clean. To add some life to the street, I recommend this fire hydrant that spawns passing cars. iCad added an invisible recolour, if you don't like to see it. Mootilda and Chris Hatch for the LotCompressor.